This fashionable open gown, dating to around 1780, would have been worn over a petticoat of silk or matching chintz fabric. 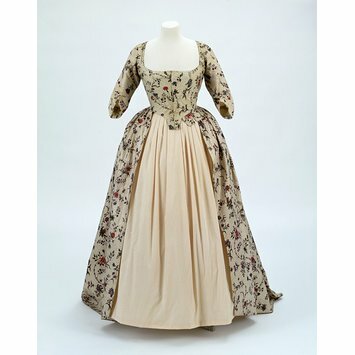 The tightly fitted bodice contrasts with the fullness of the gathered skirt, which may have been augmented with padding over the hips and back. The printed gold spot pattern would have been applied to an adhesive, probably gum arabic, after the chintz fabric had been painted and dyed. This type of deep-coloured design particularly appealed to the Dutch market, which is where the dress was probably made and worn. 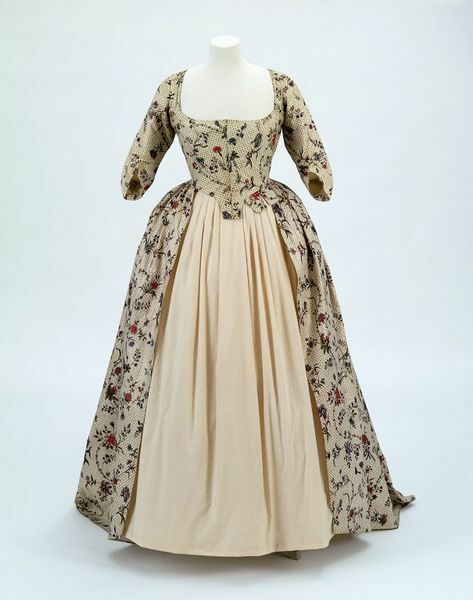 Woman's open dress of Indian cotton chintz fabric painted and block-printed with gold spots. Resist- and mordant-dyed. The robe has a fitted back with the waist seam raised over the pointed rear of the bodice. The front of the bodice, which is also pointed, closes centrally and is fastened by a drawstring which passes through the neckline. The half length sleeves are shaped at the elbow and are lined with white cotton. There are eight insertions of bone at the back of the interior bodice, which is also lined with white cotton. The skirt is constructed from three panels of fabric measuring 45 inches selvedge to selvedge. The hem which measures 0.5 inch at the back, extends to a maximum of 4 inches at the front, helping to emphasise the train. There are cotton ties at either side of the pointed back interior waistline to secure a bustle or rump pad. The chintz design consists of a delicate floral meander of stylised pinks and carnations interspersed with a single flower or cluster of flowers tied by a ribbon. The dimensions of the repeat are 21 inches wide by 21.25 inches long. The polychrome palette comprises of pink, blue, purple and green flowers and leaves on a white ground. The painted and dyed design has been over-painted with a small all-over gold spot pattern. Purchased. Registered File number 1992/1253. The glazed chintz was produced in India for the European market, and was probably shipped over in yardage and then made up into the garment in Europe. The chintz fabric was made in India's Coromandel Coast for export to the West, and made up in Holland.